Finn and Ronald chat about some of the major solar energy stories from the past week, talk solar panel direction and relive the glory of the company’s first D&D tournament. 0:17 – Finn and Ronald discuss the first SolarQuotes company Dungeons & Dragons tournament. 1:12 – Victoria’s Solar Homes Rebate has maxed out – the “solar coaster” strikes again. Just a couple of days after an announcement Victoria’s Solar Homes rebate wasn’t far off from hitting the cap for this financial year, Solar Victoria announced applications had closed – but will restart at the beginning of July. However, this means there will be next to zero new sales activity in Victoria’s residential solar power sector for the next 2.5 months – and that will cause problems for many installers. Ronald and Finn place bets on how much the new rebate will be – both are expecting it to be reduced when it fires up again in July. 3:45 – The pair talk electric cars and the Coalition’s scare campaign, or in Finn’s words “absolute horseshit”, concerning Labor’s fuel efficiency standards. 5:54 – Finn and Ronald discuss the upcoming Federal Election, which will see Australians heading to the polls on May 18. Ronald says there’s a lot of understandable cynicism and Australians should vote for the least dishonest mob. 6:41 – SolarQuotes is getting behind a charity initiative – “1% For The Planet“. SQ will donate 1% of its gross revenue to an approved charity doing good for the planet and people. We’ll be soon announcing which charity that will be, so stay tuned. 7:22 – While many will tell you the best direction to orient your solar panels is true north, it’s not quite correct. 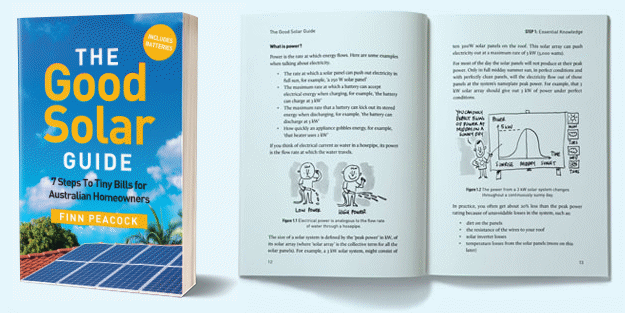 Ronald digs into the details and you can read more here – along with detailed imagery showing the optimum solar panel direction in each Australian capital. 11:22 – Best and worst reviews of the week. SolarQuotes gets a serve from a couple of parties, both of whom are mistaken about how the business works. On a brighter note, a glowing review has been submitted by a very happy customer of Replenishable Energy, a gold- rated supplier in the SolarQuotes network of pre-vetted installers. 17:30 – Hyundai Solar Panels: What’s The Hyundai Name Worth? Ronald waxes lyrical about his 2004 Hyundai Getz, but points out the company that makes the cars and the one that makes Hyundai solar panels are separate entities. Both Ronald and Finn think the panels appear to be okay and worth considering – but purchasers should be aware the company may not have the backing of the other arms of Hyundai if it runs into trouble. Read Ronald’s full Hyundai solar panel review here.